Ald. Ann Rainey (8th) introduces EPD officers at a ward meeting Thursday. Rainey and the officers urged residents to report suspicious behavior to the police. In response to a recent spike in crime and gun violence in the 8th Ward, Evanston police officers and Ald. 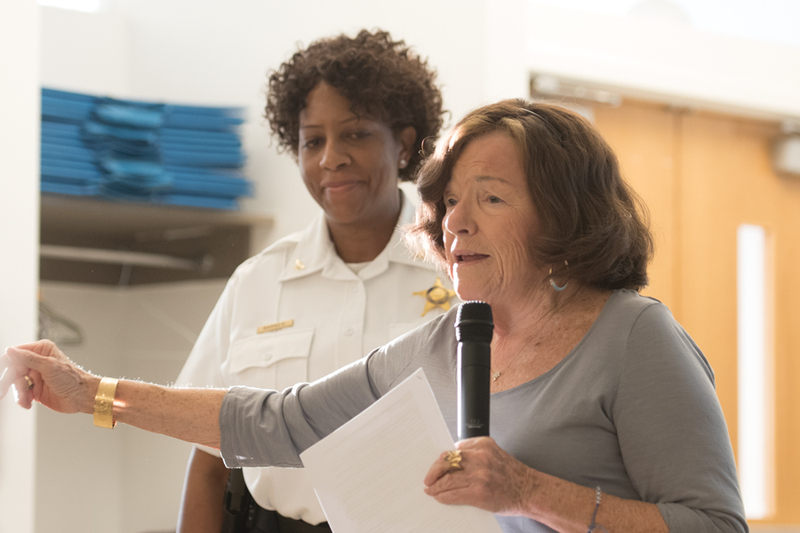 Ann Rainey (8th) said Thursday that residents should be aware and report all suspicious behavior to the Evanston Police Department. Speaking at an 8th Ward meeting at the Levy Senior Center, 300 Dodge Ave., Rainey told her residents to be vigilant of their surroundings. On May 18, two Chicago residents were shot in south Evanston. The two men who were shot were sitting in a parked car in the 300 block of Custer Avenue, unarmed, and were eventually taken to Saint Francis Hospital to be treated for non-life threatening gunshot wounds. Detectives Ken Carter and Mikhail Geyer said EPD’s quick response to the shooting would not have been possible without notification from residents. They urged attendees at Thursday’s meeting to submit tips anonymously through a texting service, call Evanston’s 311 or contact the police if they see anything suspicious. Rainey said although some residents may think that keeping track of unfamiliar cars or other changes is “too intense,” residents who are attentive can prevent violence from happening. Deputy police chief Aretha Barnes and her colleagues spoke to an increase in violent crime in the area. In summer 2017, the number of property crimes — like car thefts and burglaries — spiked, and October saw a spike in shots fired in the ward. In addition to an increase in violent crime, officers said they are tracking a number of gang-related incidents. Detective Christopher Tortorello, who works in the gangs and narcotics division, said he and his team have seen gang violence rising in the area, which shares a southern border with Chicago. He said his department is working closely with the Illinois Department of Corrections, the State Attorney’s Office and the Cook County bond court. Additionally, Tortorello said EPD is placing more of a focus on intelligence-based policing. He said intelligence-based policing, in addition to community engagement, can help ensure that EPD has the most information possible about residents and possible crime in an area. EPD’s efforts to connect with residents are also being aided by Officer Ed Gregory, who serves as the ward’s Problem Solving Team officer. Gregory, who has been active in the ward since February, is tasked with making connections with residents and businesses and acting as a liaison between EPD and community members.